Take a walking tour of the Colonial old city centre before making our way to the middle of the world to put one foot on either side of the equator. Finish with a visit to the fascinating Intiñan Museum. Fly to the Galápagos Islands for a cruise through one of the world’s most unique environments. Sailing schedule varies depending on your vessel and local conditions. Your cruise will visit various islands, beaches, bays and inlets to reveal the wonders of Galápagos. Each day, you will be taken on guided walks, excursions and boat tours to discover the unique landscapes and wildlife, such as giant Galápagos tortoise, sea lion colonies, green sea turtles, land and marine iguanas, and a variety of bird life. Note: Daily cruise schedule is subject to change. Your cruise will visit various islands, beaches, bays and inlets to reveal the wonders of Galápagos. Each day, you will be taken on guided walks, excursions and boat tours to discover the unique landscapes and wildlife. Afternoon city tour of Lima visiting and ancient pyramid, the main plaza and Santo Domingo Church. You’re Invited: Guided tour of the Larco Museum. Afterwards, enjoy dinner at the museum. Ollantaytambo walking tour. You’re Invited: Visit a community and meet the locals. Take the Vistadome train to Machu Picchu, the “Lost City of the Incas” for a guided tour of the ruins. Guided walking tour of Cuzco, the former capital of the Incas. Tonight, dine at a local restaurant. Fly to Lake Titicaca and enjoy an excursion to the floating islands of Uros. Fly to the World Heritage listed Iguazú Falls. See the Argentinian side of the falls including the ‘Devil’s Throat’ viewpoint. Visit the majestic Brazilian falls before flying to Rio de Janeiro. Tour the marvellous sights of Rio de Janeiro. You’re Invited: Visit the Sambadrome, and try on carnival costumes#. This evening, feast like a local at a Brazilian Churrascaria. Today is free to explore Rio. Fly to Buenos Aires, Argentina, a country rich in history and culture. With a strong European influence, Buenos Aires is wonderful city to discover. Tour this beautiful city visiting the central square, Plaza de Mayo. Drop in to a traditional café before travelling through San Telmo and down the colourful roads of La Boca. Finish at Recoleta Cemetery, an amazing above ground cemetery. You’re Invited: This evening, soak up a tango show accompanied by a sumptuous dinner. Make use of the on board facilities or go ashore to make the most of your final day in Buenos Aires. Montevideo is a charming city with colonial customs, and the old town is a delight to wander. Nearby is Colonia del Sacramento, the oldest city in Uruguay and a UNESCO World Heritage Site (shore excursions at own expense). Relax as you cruise south towards the Falkland Islands. Reach the remote Falkland Islands, a country with a long and fascinating history, unique culture and natural beauty. Weather permitting, we visit the capital Port Stanley, which is easily explored on foot. Further afield, there are large colonies of king, gentoo and Magellanic penguins (shore excursions at own expense). 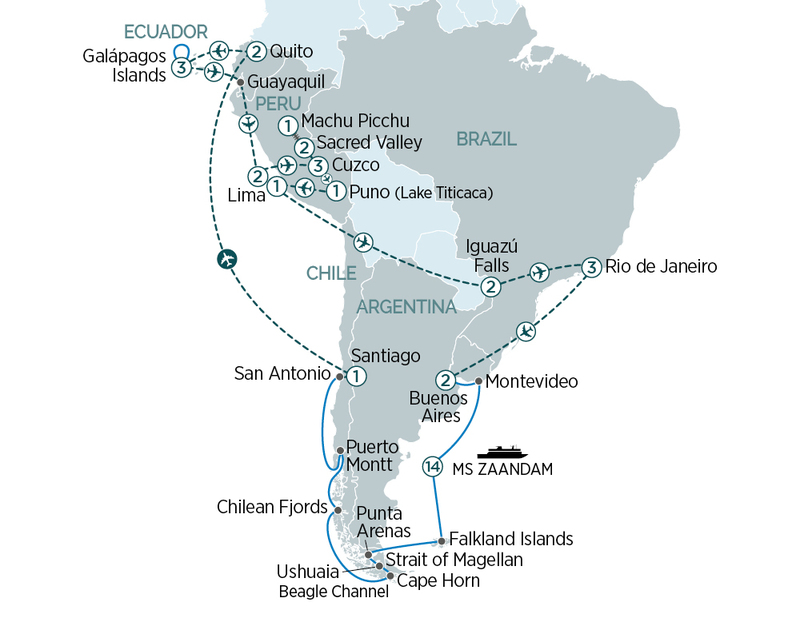 Cruise back to the mainland and the spectacular Patagonian Argentina. The Strait of Magellan lies between mainland South America and the island of Tierra del Fuego (the land of fire). It is a narrow and important stretch of water and an important trade route. Lined with snowbound mountains and forest, it is often likened to the Inside Passage in Alaska. Punta Arenas grew to prominence due to trade through the Magellan Strait. Today, it is the largest town and the capital of Southern Chile. Highly recommended is a visit to Torres del Paine National Park with its unique geography. Make your way into the Cockburn Channel connecting the Strait of Magellan to the Beagle Channel, named after the HMS Beagle that carried Charles Darwin through this region and on to the Galápagos Islands. Finish the day cruising through Glacier Alley, an extraordinary piece of nature with numerous tongues of glaciers that snake down to the sea (shore excursions at own expense). The southernmost town in the world, where dominating peaks loom on three sides and the fourth opens to the Beagle Channel. Ushuaia is a quaint town perfect for exploring on foot. Known as a landmark in cruising and navigation, Cape Horn is the most southerly mainland point in the world. Continue through the iconic and breathtaking scenery of the Chilean Fjords. Be among the lucky few to spend a glorious day scenic cruising through Tierra del Fuego and the snow-capped peaks and ethereal blue glaciers of Canal Sarmiento. This majestic waterway is surrounded by other-worldly beauty, and in many places, massive glaciers run down to the sea. All kinds of marine animals live in this dramatic landscape. Sail through the beautiful maze of islets known as the Chilean Fjords. Renowned as being some of the most spectacular in the world and rivalling those of Norway and Alaska, this region consists of a 1,000-mile maze of virgin-forested islands, glistening glaciers and beautifully sculpted mountains. Puerto Montt is the gateway to the scenic Lakes District and contains a series of pine forests, icy lakes, Bavarian hamlets and snow-capped volcanoes. Spend the day cruising the coast of Chile reflecting on all the marvels you have seen. Disembark in the morning at San Antonio and bid farewell to your crew. Transfer to Valparaiso, a steep amphitheatre renowned for its brightly coloured residences and church steeples. UNESCO has declared it a World Heritage site. Ride one of the city’s many funiculars and take in the views. Make our way to Santiago, the country’s capital. Tonight, enjoy a farewell dinner. # Sambadrome may be closed due to Rio Carnival period.